Iowa patients who suffer an injury or death because of medical malpractice may be approached by the hospital’s lawyer or the hospital administrator. This meeting is the Iowa medical communities's version of the corrupt politician's "Hush-Money-Meeting". It is where they try to sweep their dirt under a rug and run it out the back door. At this meeting the hospital will have lawyers participating. They will likely say this is a formality, but it isn't. They may even tell you it is routine. It certainly isn't routine. If I were a betting man, which I am not, I'd guess they will tell you how sorry they are for your loss, but it is not there fault. They will go on with other distractions just before they say, "Even though it is not our fault, we want to make things right for you, easier for you, and so we are prepared to pay you a tidy sum of money..."
WHY DO THE HOSPITAL'S LAWYERS WANT TO SPEAK WITH ME? The lawyers are there for a reason and that reason isn't favorable to you, the patient. They will say it is for you, but it really isn't about you as much as it is about sweeping their dirt under the rug, as quickly and inexpensively as possible. 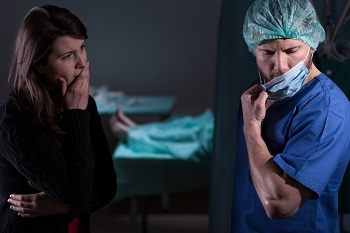 The Iowa legislature passed medical malpractice deforms and these deforms included a hush-money meeting intended to allow doctors and hospitals to bury their patients while hiding their mistakes. At trial you will not be able to introduce into evidence what they admitted to. This will allow them to perjury themselves and get away with it. Don't be a victim. Read today as Attorney Lombardi discusses how you can protect yourself from their greed. I have a source who indicates the hospital lawyers and insurance reps. do not want the hospital's doctor talking directly to the patient. The purpose of the confidential meeting ending in the payment of hush money is not intended to do patients any favors. Quite the opposite. If it was intended to protect patients, then doctors would be put under oath, the patients required to be represented by a lawyer and all statements would be recorded. But none of that is required and so today I’m going to tell you what to do in order to protect yourself and your family. Because frankly, they may be friendly, but they are not your friend. One of the gimmicks the Iowa Legislature passed allows the doctor's representatives to meet with the patient to offer them hush money after the doctor has commited malpractice. For this meeting, assuming you would like to be treated fairly, you will need a lawyer. Here is why. The doctor and hospital are on a fishing expedition and will bait you into wanting to come to this meeting by offering you money. The doctor and hospital benefit from the meeting by fishing for anything you can tell them that will lower the value of your case. With your own lawyer you don't have to say a thing, you just have to listen. The lawyer will do all the talking. You are outgunned, out manned, haven’t the resources and don’t understand the issues well-enough to know when you’re drowning. You don’t understand liability and they do. You don’t understand what your case is really worth and all they care about is paying you as little as possible. You don’t know what not to say in order to dig a hole for yourself. The deck is stacked against you and that’s the point of them wanting to meet with you. This meeting is a gimmick intended to remove your being represented in order to bury their mistakes. And frankly, who cares so long as they pay you enough money. You will need someone who understands the issues, can listen very carefully, ask questions and then understand exactly what the doctor believes he or she did wrong. You will need someone who can take what is said at the meeting and use it in the lawsuit that is guaranteed to come, if they don’t offer you enough. An offer of $100,000.00 may seem like a lot, but anyone can settle a million dollar case for $100,000. We handle these hush-money conferences and invite you to call us for representation. This change in the law including caps on damages does nothing to encourage better and safer medical practice. By making it cheaper for bad doctors to practice medicine, it does exactly the opposite. It attracts every bad doctor to come to Iowa and experiment on rural Iowans. Political Statement – Your Misfortune Is Their Gain - How do doctors look patients directly in the eye at the grocery store? Rural Iowa’s fake need to attract doctors is apparently more important to your state legislator, that bad doctors are good enough to take care of your health needs. And if and when they kill or maim you their insurance company will not have to pay you much. I have to wonder how many campaign dollars it took to turn off their consciences. Now your right to receive compensation has been limited and in the process lawyers will no longer be interested in taking most medical malpractice cases. And that is really what this is about. It is about making lawyers not available to injured patients or those who bad doctors kill. This Law Had Nothing to Do with Rural Doctors – If so, they would have it apply, only in rural Iowa. Con-Man ALERT! What the Iowa Senate and House passed is a recipe for a disaster. Today we are going to discuss the Terry Branstad Hush Money provision; otherwise known as the confidential conference after an adverse event. Sen. Charles Schneider, R-West Des Moines, said Iowa ranks 43rd nationally per capita in doctors. One of the key factors is the cost of liability insurance premiums, which are not competitive compared to neighboring states, he said. Thirty-five other states have caps on medical liability, he noted.” Des Moines Register, March 20, 2017. Senate File 465. I wonder which country club he belongs. Senator Schneider apparently receives top-notch medical care and isn’t worried about malpractice. But if his family or even he is involved with a malpractice event, he’ll be screaming the loudest about how he should be treated differently than all the rest of you. Call us because you need us in your corner.